Performed at the Logan Center for the Arts, "Manufacturing Mischief" satirizes Noam Chomsky, Karl Marx, Elon Musk, and President Drumpf as puppets. It’s easy to think of puppets in the context of the TV we grew up watching. As a puppeteer myself, the whole reason I became interested in the craft was from watching Sesame Street and Between the Lions. But puppetry as an art form exists in more variations than just children’s entertainment: It can be political, raunchy, dramatic, and even avant-garde. And it was explored in all of its glory at this year’s Chicago International Puppet Theater Festival, which ended this past Sunday. Cofounded by Chicago-based puppeteer Blair Thomas, the festival is a biennial event created in an attempt to turn Chicago into “the puppetry capital of the world.” This year marked the third time this event has been held; more than 20 different shows held all across the greater Chicago area included the works of puppeteers hailing from 11 countries. The festival opened Thursday, January 17, at the Studebaker Theater with Ajijaak on Turtle Island, a First Nations tale codirected by Ojibwe performance artist Ty Defoe and Heather Henson (daughter of Muppets creator Jim Henson) and her group Ibex Puppetry. The production used stunning visuals by way of projections and complex puppets that occasionally elicited gasps when the audience recognized what they were seeing. The production’s influence on the festival resonated all throughout the week: Shows often began with statements from Puppet Festival board members informing audiences that the theater they were in was built on the land of the Potawatomi and Miami people, among others—a constant reminder that we were enjoying entertainment on stolen land. One could scarcely go a mile without catching a unique puppet show. Of particular note was the Festival Neighborhood Tour, which toured Poncili Creación’s The Beginning of Nothing and Gaspare Nasuto’s Pulcinella across Chicago to foster an interest in puppetry in various corners of the city, including the Experimental Station at 61st Street and Blackstone Avenue. 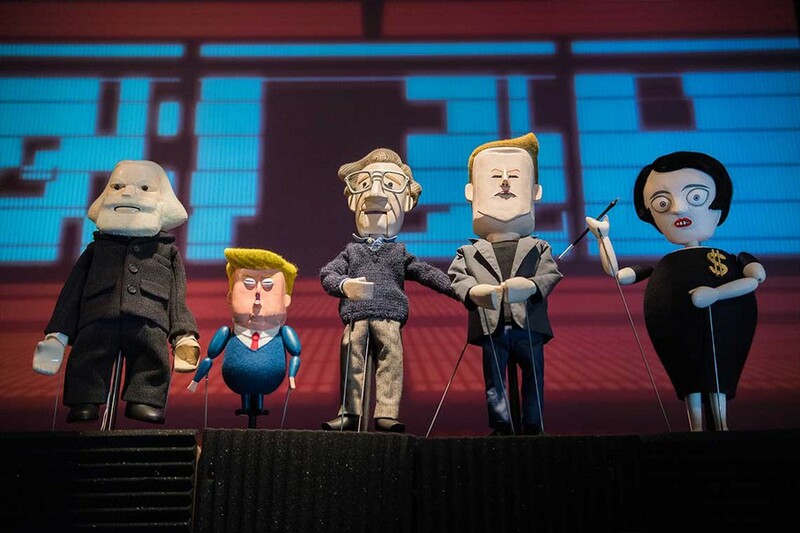 At the Logan Center for the Arts, Pedro Reyes’s Manufacturing Mischief delighted audiences with its satirical take on ethics and philosophy via puppet caricatures of Noam Chomsky, Steve Jobs, Ayn Rand, Karl Marx, Elon Musk, and President Donald Trump. The Dance Center at Columbia College presented Plexus Polaire’s Chambre noire, a haunting piece framed as the hallucinations of a dying Valerie Jean Solanas, most famous for writing the SCUM Manifesto and attempting to shoot Andy Warhol. Meanwhile, the Art Institute of Chicago’s Stock Exchange Room featured the ever-popular Shank’s Mare, a collaboration between American puppet artist Tom Lee and Japanese puppeteer Koryu Nishikawa V which utilized projections, shadow play, miniatures, and the traditional Japanese kuruma ningyo (or cart puppetry, in which a puppeteer sits on a wheeled box while operating the puppet). In Andersonville, the Neo-Futurists presented Tedium and Other Sensations, a combination of ensemble member Dan Kerr-Hobert’s Tedium and Mocrep’s companion piece Other Sensations, an overall bizarre piece which I have come to love. Other shows were held at the Instituto Cervantes and Navy Pier. Things were quite busy at Wicker Park’s Chopin Theatre. On its mainstage was Compagnie La Pendue’s Tria Fata, a macabre cabaret that, as the one-man band musician told us, deals with life and death. Combining puppetry with some gorgeous shadow play, the piece was as fun as it was disturbing, causing uproarious laughter in one moment and stunned silence the next. It made a fitting counterpoint to the other show at the Chopin, Kentucky-based puppeteer Andy Gaukel’s Schweinehund, inspired by the true story of Frenchman Pierre Seel who was deported to a concentration camp on suspicion of homosexuality in 1941. Another multimedia experience, Schweinehund was one of the darkest pieces of the entire festival. One could scarcely go a day without seeing a show at Links Hall, the busiest venue of the entire festival. One could catch Jeghetto’s haunting and political Just Another Lynching: An American Horror Story, or later, Cabinet of Curiosity’s surreal Tabletop Tragedies. Links Hall was also home to cabarets that offered a single night of a variety of puppet shows: Nasty, Brutish & Short, the venue’s quarterly cabaret of short-form puppet theater, had a festival edition that presented late night amusement that was a stark contrast to its counterpart Immaculate, Poignant, and Medium Length. One of the highlights was “Crosstalk” by UChicago alum Myra Su (A.B. ’13) who offered one of the most creative uses of the Crankie puppetry mechanism I have ever seen. Perhaps the most bewildering piece of the entire festival was Mariano Pensotti’s Arde brillante en los bosques de la noche (Burning bright in the forest of the night), performed at the Museum of Contemporary Art. What started as a puppet show about a professor of Russian history turned into a play about a guerilla fighter who returns home to find out things have changed, which then morphed into a film about a journalist whose unexpected promotion leads her on a path she never expected. The pure creativity behind Arde brillante speaks to the whole spirit of the festival, which offers the chance to experience the individuality of both Chicago-based as well as international artists as they take on the medium of puppetry and make it their own. Although I saw around 20 shows myself, I never found myself thinking, “I’ve seen this all before.” The Chicago International Puppet Theater Festival amused, shocked, and delighted in its brief two-week stint, and I eagerly look forward to its return in 2021.